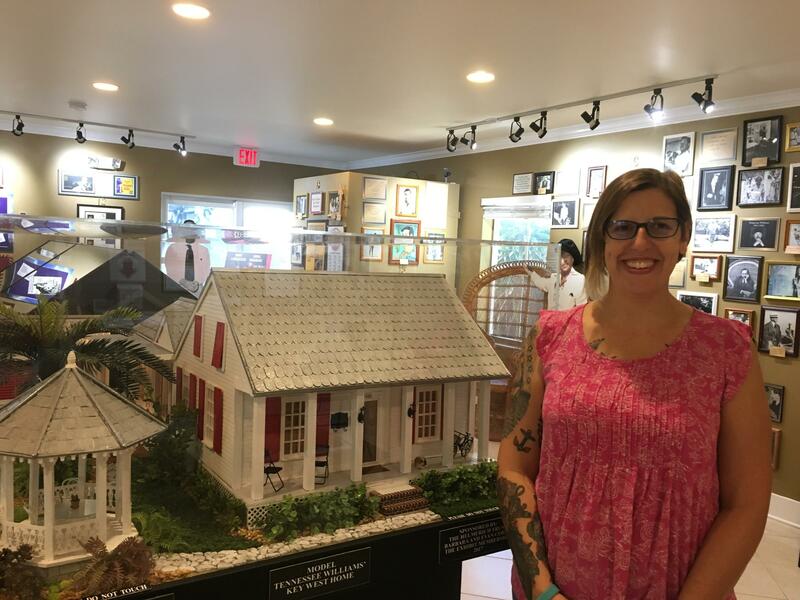 Key West Art & Historical Society Curator Cori Convertito with the new model of Tennessee Williams' Key West home, now part of the Tennessee Williams Museum. 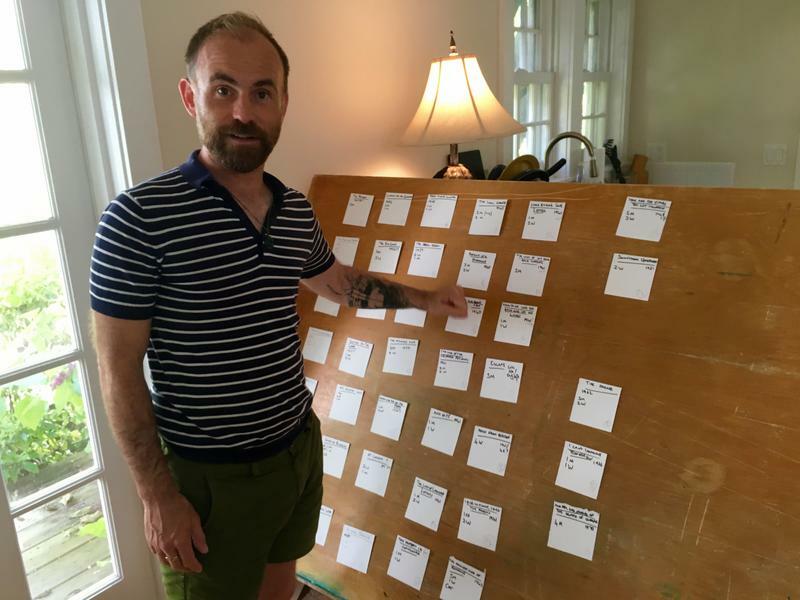 Local appreciation of the playwright has been growing since 2011, when Dennis Beaver and Bert Whitt started the Tennessee Williams Exhibit to mark the 100th anniversary of the writer’s birth. This month, the exhibit became part of the Key West Art & Historical Society. That group already had three museums on the island — the Custom House, the Key West Lighthouse and Fort East Martello. 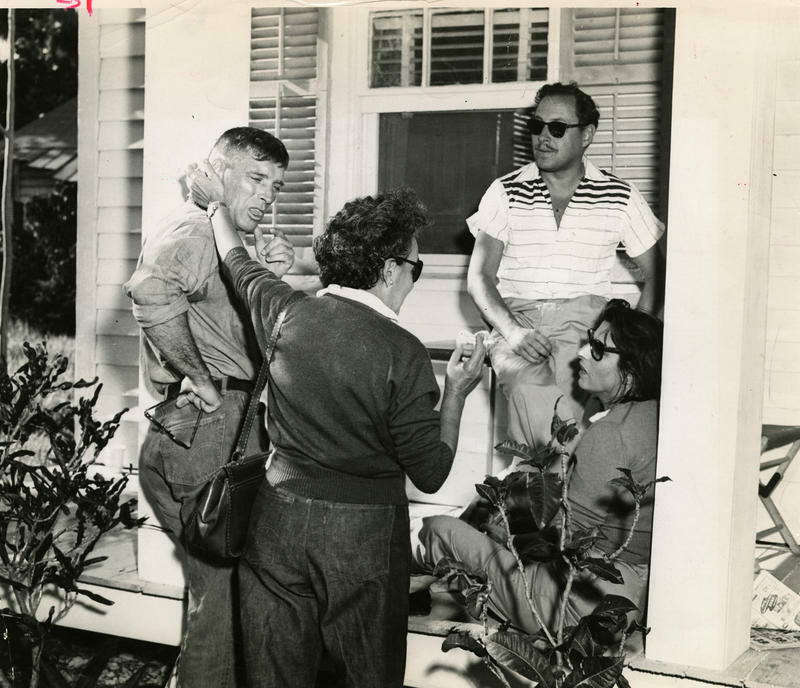 Tennessee Williams, in sunglasses, with from left, Thomas McGuane, Truman Capote and James Kirkwood in Key West. Convertito said Williams’ life and work in Key West is worth its own museum because of his long-term residency and involvement with the local community. He was a supporter of local groups like the Key West Library and the animal shelter, she said. “He’s a kind of major thread in the fabric of Key West,” she said. Beaver and Whitt collected numerous photographs and press accounts of Williams’ life, as well as some artifacts like the typewriter he used when he was on the island. The Art & Historical Society has added a new model of his home. The home is privately owned and, unlike Hemingway’s, people still live there. So it’s not a museum, open to the public. Convertito said the Society plans to keep the Williams exhibit separate, as its own entity. 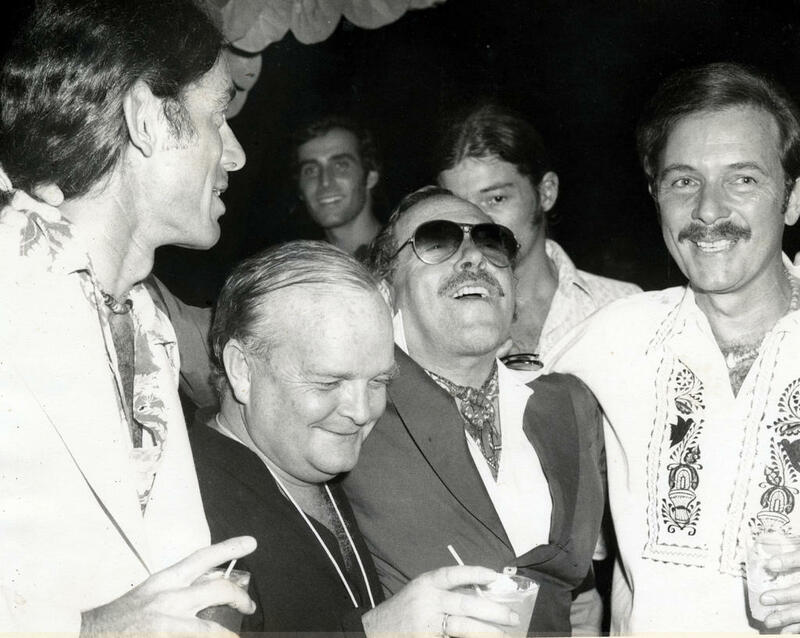 The Society is also working with Beaver and Whitt to continue the annual Tennessee Williams Birthday Celebration in March, with talks, theatrical presentations and parties. 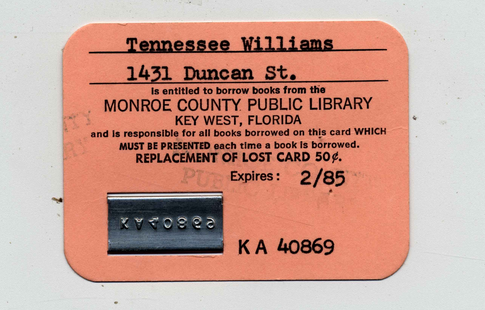 The Tennessee Williams Museum is at 513 Truman Ave., Key West. It is open daily from 9:30 a.m. to 4:30 p.m. Admission is $7 for adults; free to children under the age of 6 and to members of the Key West Art & Historical Society. Sixty years ago, a film partially shot in Key West won three Academy Awards — including Best Actress. Anna Magnani was the first Italian actress to win an Oscar. She won for her role in "The Rose Tattoo," a movie based on the play by her close friend Tennessee Williams. The house where Magnani's character lived has recently been restored by an Italian couple. Carla Agostini Gay is a major movie buff and Magnani is her favorite actress. 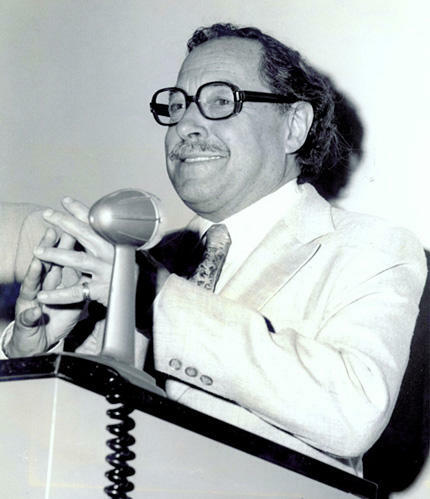 Tennessee Williams (1911-1983) was perhaps the most influential playwright of the twentieth century. During the 1940s and 1950s, his work took the American theater by storm, achieving enormous popular success and the sort of feverish criticism only accorded writers of groundbreaking genius. His best-known works include A Streetcar Named Desire, whose 1947 Broadway production launched the careers of Marlon Brando and Jessica Tandy, and the 1955 Cat on a Hot Tin Roof.